For the film adaptations of the play, see Saint Joan (disambiguation). Michael Holroyd has characterised the play as "a tragedy without villains" and also as Shaw's "only tragedy". John Fielden has discussed further the appropriateness of characterising Saint Joan as a tragedy. The text of the published play includes a long Preface by Shaw. Shaw characterised Saint Joan as "A Chronicle Play in 6 Scenes and an Epilogue ". Joan, a simple peasant girl, claims to experience visions of Saint Margaret, Saint Catherine, and the archangel Michael, which she says were sent by God to guide her conduct. Scene 1 (23 February 1429): Robert de Baudricourt complains about the inability of the hens on his farm to produce eggs. Joan claims that her voices are telling her to lift the siege of Orléans, and to allow her several of his men for this purpose. 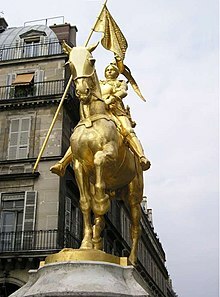 Joan also says that she will crown the Dauphin in Reims Cathedral. De Baudricourt ridicules Joan, but his Steward feels inspired by her words. De Baudricourt eventually begins to feel the same sense of inspiration, and gives his consent to Joan. The Steward enters at the end of the scene to exclaim that the hens have begun to lay eggs again. De Baudricourt interprets this as a sign from God of Joan's divine inspiration. Scene 2 (8 March 1429): Joan talks her way into being received at the court of the weak and vain Dauphin. There, she tells him that her voices have commanded her to help him become a true king by rallying his troops to drive out the English occupiers and restore France to greatness. Joan succeeds in doing this through her excellent powers of flattery, negotiation, leadership, and skill on the battlefield. Scene 3 (29 April 1429): Dunois and his page are waiting for the wind to turn so that he and his forces can lay siege to Orléans. Joan and Dunois commiserate, and Dunois attempts to explain to her more pragmatic realities of an attack, without the wind at their back. Her replies eventually inspire Dunois to rally the forces, and at the scene's end, the wind turns in their favour. Scene 4 (June 1429): Warwick and de Stogumber discuss Joan's stunning series of victories. Joined by the Bishop of Beauvais, they are at a loss to explain her success. De Stogumber decides Joan is a witch. Beauvais sees Joan as a threat to the Church, as she claims to receive instructions from God directly. He fears she wants to instill national pride in the people, which would undermine the Church's universal rule. Warwick thinks she wants to create a system in which the king is responsible to God only, ultimately stripping him and other feudal lords of their power. All agree that she must die. Scene 5 (17 July 1429): the Dauphin is crowned Charles VII at Reims Cathedral. A perplexed Joan asks Dunois why she is so unpopular at court. He explains that she has exposed very important people as incompetent and irrelevant. She talks to him, Bluebeard, and La Hire about returning home. Charles, who complains about the weight of his coronation robes and smell of the holy oil, is pleased to hear this. She then says to Dunois "Before I go home, let's take Paris", an idea which horrifies Charles, who wants to negotiate a peace immediately. The Archbishop berates her for her "sin of pride". Dunois warns her that if she is captured on a campaign he deems foolhardy, no one will ransom or rescue her. Now realizing that she is "alone on earth", Joan declares that she will gain the strength to do what she must from the people and from God. She leaves, leaving the men dumbfounded. Joan: "You think that life is nothing but not being dead? It is not the bread and water I fear. I can live on bread. It is no hardship to drink water if the water be clean. But to shut me from the light of the sky and the sight of the fields and flowers; to chain my feet so that I can never again climb the hills. To make me breathe foul damp darkness, without these things I cannot live. And by your wanting to take them away from me, or from any human creature, I know that your council is of the devil." Joan accepts death at the stake as preferable to such an imprisoned existence. De Stogumber vehemently demands that Joan then be taken to the stake for immediate execution. The Inquisitor and the Bishop of Beauvais excommunicate her and deliver her into the hands of the English. The Inquisitor asserts that Joan was fundamentally innocent, in the sense that she was sincere and had no understanding of the church and the law. De Stogumber re-enters, screaming and severely shaken emotionally after seeing Joan die in the flames, the first time that he has witnessed such a death, and realising that he has not understood what it means to burn a person until he has actually seen it happen. A soldier had given Joan two sticks tied together in a cross before the moment of her death. Bishop Martin Ladvenu also reports that when he approached with a crucifix to let her see it before she died, and he approached too close to the flames, she warned him of the danger from the stake, which convinced him that she could not have been under the inspiration of the devil. O God that madest this beautiful earth, when will it be ready to accept thy saints? How long, O Lord, how long? One historian at the time (1925) reacted to the play by arguing that it was highly inaccurate, especially in its depiction of medieval society. Shaw states that the characterization of Joan by most writers is "romanticized" to make her accusers come off as completely unscrupulous and villainous. More general interpretation of Joan's character is to describe her as a rebel against general institutional authority, such as that of the Catholic Church and to the feudal system. Contemporary comments have noted her particularly strong form of religious belief and how it borders on religious fanaticism. Tony Stafford discussed Shaw's use of imagery related to birds in the play. Frederick Boas has compared the different treatments of Joan in dramas by Shakespeare, Schiller, and Shaw. T. S. Eliot, discussing the play after its premiere in London in 1924, wrote that although Saint Joan was not the masterpiece that some claimed it to be, the play "seems to illustrate Mr. Shaw's mind more clearly than anything he has written before." And although he credited Shaw with providing an "intellectual stimulant" and "dramatic delight", he took issue with his portrayal of the heroine: "his Joan of Arc is perhaps the greatest sacrilege of all Joans: for instead of the saint or the strumpet of the legends to which he objects, he has turned her into a great middle-class reformer, and her place is a little higher than Mrs. Pankhurst" (the militant leader of the British suffragettes). Shaw's personal reputation following the Great War was at a low ebb, and it is thought that he wanted to first test the play away from Britain. The play received its premiere on 28 December 1923 at the Garrick Theatre on Broadway by the Theatre Guild with Winifred Lenihan in the title role. The London première, which opened on 26 March 1924 at the New Theatre, was produced by Lewis Casson and starred Shaw's friend Sybil Thorndike, the actress for whom he had written the part. Costumes and sets were designed by Charles Ricketts, and the play had an extensive musical score, specially composed and conducted by John Foulds. Caught between the forces of the Church and the Law, Joan is the personification of the tragic heroine and the part is considered by actresses (see below) to be one of the most challenging of roles to interpret. It is usually played by very experienced actresses who are much older than the age of the character, a teenager. For a film version, Joan was exceptionally played by Jean Seberg, who was 19. Other notable Joans include Judi Dench, Zoe Caldwell, Elisabeth Bergner, Constance Cummings, Ann Casson, Roberta Maxwell, Barbara Jefford, Pat Galloway, Sarah Miles, Ellen Geer, Jane Alexander, Lee Grant, Janet Suzman, Maryann Plunkett, Eileen Atkins, Kitty Winn and Sarah Snook. In 1927, Lee de Forest filmed Sybil Thorndike in the cathedral scene from Saint Joan in a short film made in his Phonofilm sound-on-film process. In 1957, the play was adapted for film by Graham Greene, directed by Otto Preminger, with Jean Seberg as Joan of Arc, Richard Widmark, Richard Todd, and John Gielgud. Lanford Wilson's 2000 play Book of Days is a modern-day re-imagining of Saint Joan. Caedmon Records released a complete audio adaptation of the play in a four-record stereo LP boxed-set with full script booklet. It starred Siobhán McKenna as Joan, Donald Pleasence as The Inquisitor, Felix Aylmer as Peter Cauchon and Alec McCowen as The Chaplain. Blackstone Audio released a full-cast recording starring Amy Irving, Edward Herrmann, Kristoffer Tabori, Gregory Itzen, Armin Shimerman, Granville Van Dusen, among others. The production, which was directed by Yuri Rasovsky, won an Audie Award as Best Audio Drama of 2010. The play has also been adapted into an opera by composer Tom Owen. ^ Holroyd, Michael (14 July 2007). "A tragedy without villains". The Guardian. Retrieved 2009-01-18. ^ Fielden, John (July 1957). "Shaw's Saint Joan as Tragedy". Twentieth-Century Literature. Hofstra University. 3 (2): 59–67. doi:10.2307/441003. JSTOR 441003. ^ Robertson, J. M. (1926). Mr. Shaw and "The Maid". London: Cobdon-Sanderson. p. 85. ^ Billington, Michael (12 July 2007). "Saint Joan: Olivier Theatre, London". The Guardian. Retrieved 2009-01-18. ^ Gardner, Lyn (3 July 2007). "The shock of the old". The Guardian. Retrieved 2009-01-18. ^ Stafford, Tony J. (1986). "From Hens' Eggs to Cinders: Avian Imagery in Shaw's Saint Joan". Rocky Mountain Review of Language and Literature. Rocky Mountain Modern Language Association. 40 (4): 213–220. doi:10.2307/1566575. JSTOR 1566575. ^ Boas, Frederick S. (January 1951). "Joan of Arc in Shakespeare, Schiller, and Shaw". Shakespeare Quarterly. Folger Shakespeare Library. 2 (1): 35–45. doi:10.2307/2866725. JSTOR 2866725. ^ Eliot, T. S. (October 1924). "A Commentary". The Criterion. 3: 1–5. ^ Harben, Niloufer. Twentieth-century English history plays: from Shaw to Bond. p. 31. ISBN 0-389-20734-9. ^ Guttenberg, Percy (c. 1924). "Portrait of Sybil Thorndike as St. Joan in George Bernard Shaw's St. Joan" (picture). Digital Collections – Pictures. National Library of Australia. Retrieved 2012-11-08. ^ Gray, Tom. "St. Joan May Be Theater's Best Effort". The Atlanta Constitution. October 13, 1965. Retrieved 2018-07-16. ^ Clapp, Susannah (15 July 2007). "Joan burns bright in a match made in heaven". The Observer. Retrieved 2009-01-18. ^ "Saint Joan – Donmar Warehouse". www.donmarwarehouse.com. Retrieved 2016-09-11. ^ "Condola Rashad to Star in Saint Joan on Broadway". www.playbill.com. Retrieved 2018-02-20. ^ "Spring Opera Productions". The University of Sheffield. Archived from the original on 2008-12-23. Shaw, Bernard (1924). Saint Joan: A Chronicle Play in 6 Scenes and an Epilogue. London: Constable & Co., Ltd. OCLC 248014614. This page was last edited on 16 January 2019, at 18:24 (UTC).